There is no reason why the aeroplane should not open up a fruitful occupation for women. I see no reason why they cannot realize handsome incomes by carrying passengers between adjacent towns, why they cannot derive incomes from parcel delivery, from taking photographs from above, or from conducting schools for flying. Any of these things it is now possible to do. Quimby was the first woman in the United States to gain a pilot's license, and the first woman to make a nighttime flight and to fly across the English Channel. She also wrote screenplays for D.W. Griffith and designed her own purple satin flight suit. She was Amelia Earhart's personal hero. 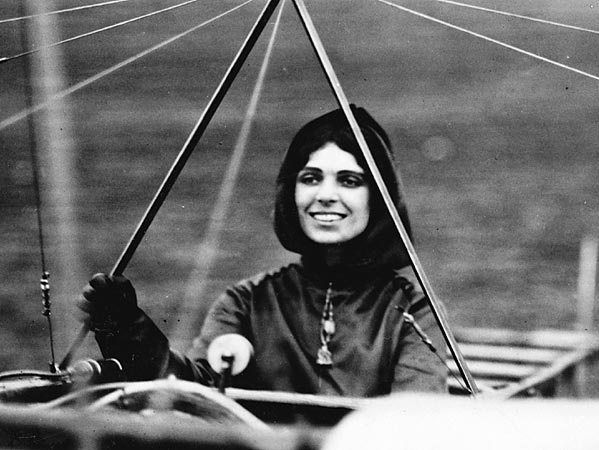 Photo: Quimby in her Blériot monoplane, 1911.